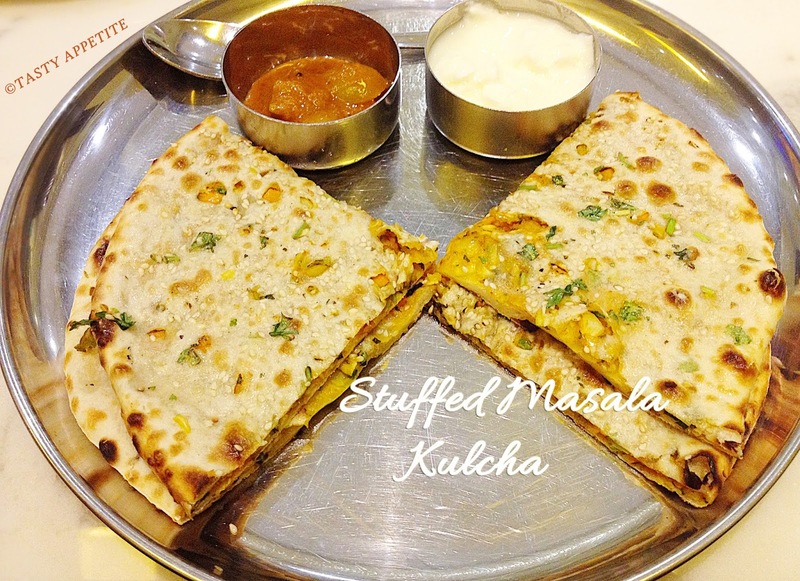 Stuffed Kulcha Recipe / Stuffed Masala Kulcha / How to make Stuffed Kulchas at Home? 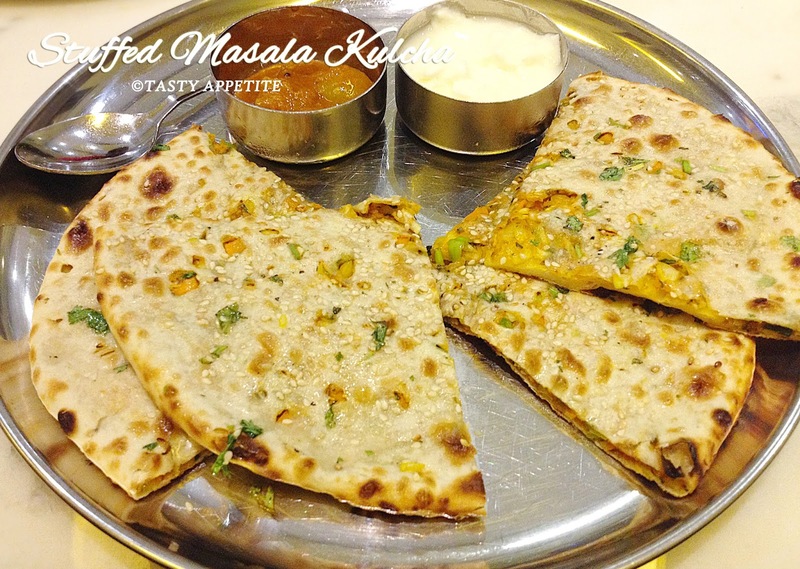 Stuffed Masala Kulcha: Today’s recipe is a very popular North Indian Stuffed Masala Kulcha. 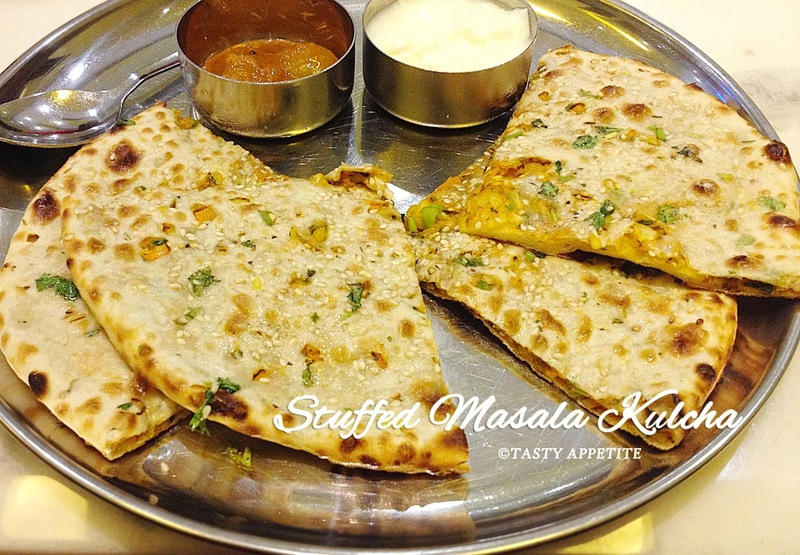 It is an appetizing & filling dinner recipe from the regular naan and roti. It tastes soft and delicious with spicy masala stuffing. It pairs up great with yoghurt and pickle. Lets see..
how to prepare this super simple kulcha at home..! 1. Sieve all purpose flour and keep ready. 2. Add a tsp of yeast to ½ cup of lukewarm milk. 3. Set it aside for minimum 1 hour. 4. In a mixing bowl, add all purpose flour, salt, baking pwd and sugar. 6. To it add yoghurt, yeast mixture and oil or ghee. 7. Knead it to smooth soft dough. 8. Cover it with a damp cloth or cling film and let it rest for 2 hours. 9. Meanwhile lets prepare the masala stuffing. 10. Boil the potatoes, peel and mash it. 11. Take it in a mixing bowl. 12. Add grated paneer to it. 13. Add the spices red chilly pwd, coriander pwd, cumin pwd, garam masala pwd, amchur pwd and salt. 14. Add finely sliced green chilly and coriander leaves. 16. Divide into equal sized balls. 17. Now make balls out of the dough. 18. Roll it to small disc. 19. Stuff the masala mixture balls and seal the edges. 20. Dust it with flour and flatten these balls to thick parathas. 21. Sprinkle sesame seeds and roll it slightly. 22. Heat a dosa pan. 23. Grease it with ghee/oil. 24. Place the flattened parathas carefully. 25. Fry them on both sides by drizzling oil. 26. Once it is golden brown, remove from flame. 27. Stuffed masala kulchas are ready. 28. Relish hot with yoghurt, pickle or with any spicy gravy.